Painting The Temptation in the Wilderness by Briton Riviere, ca. 1920. O God, you made us in your own image and redeemed us through Jesus your Son: Look with compassion on the whole human race, O Lord; take away the arrogance and hatred which infect our hearts; break down the walls that separate us; unite us in bonds of love; and work through our struggle and confusion to accomplish your purposes on earth. That, in your good time, all nations and races may serve you in harmony around your heavenly throne; through Jesus Christ our Lord. Lord, pour your love into my heart, that I may love you above all things, and my neighbors as myself. Through Christ our Lord. 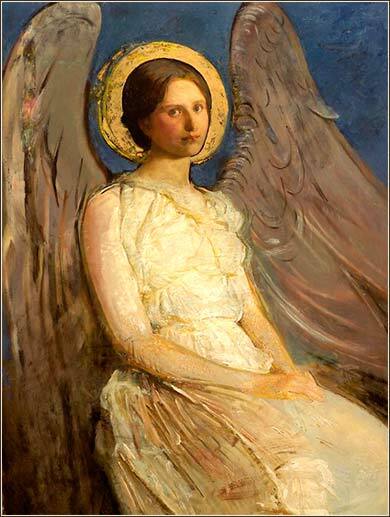 Seated Angel by Abbott Thayer, ca. 1899. I have known millionaires starving for lack of the nutriment which alone can sustain all that is human in man, and I know workmen, and many so-called poor men, who revel in luxuries beyond the power of those millionaires to reach. Then Jesus was led by the Spirit up into the desert, to be tempted by the devil. 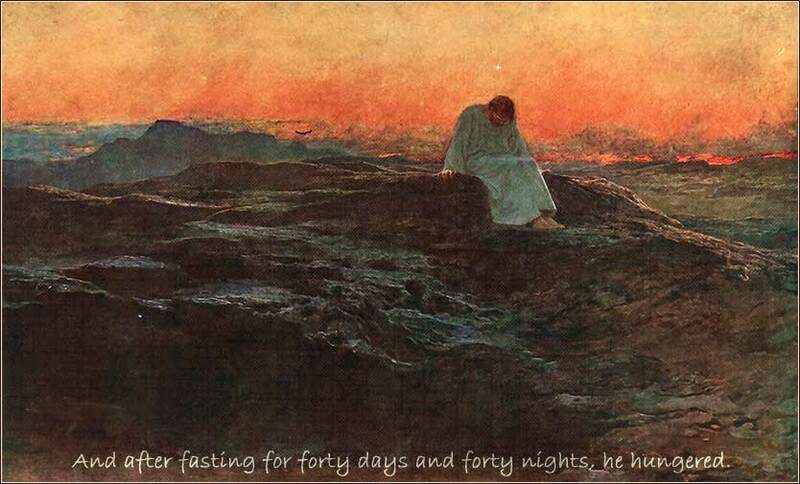 After a fast of forty days and nights he was very hungry. At the outset, we need to understand that the word “tempt” in Matthew 4 does not do justice to the full intended meaning of today's passage. The original Greek word (peirazo) connotes more in the way of a test than the connotation of being allured to do something wrong, conveyed by the English word “tempt”. If a blacksmith makes a sword, what is the first thing he does when it is finished? He tries it out. He tests it. And this is the first thing Jesus does after His baptism and the initiation of his great mission. God has made himself human, unspotted with sin, the first and only of his kind; immediately after his baptism, Jesus goes to the wilderness to test himself. For no human has ever before fully resisted Satan. He begins by weakening himself to the point of physical breakdown. The period “forty days and forty nights” is idiomatic; we might say “for many weeks.” But the length of time is not really important. The point is that Christ wandered alone in a stony desert until he had reached the limit of human strength. He was at the point of starving to death; he intentionally maximized his vulnerability. This is not a fight that Christ will win once and be done with, for he is human. He will face temptation his entire life, just as we do. Again, when one tests a sword, it is only a prelude to the battles ahead. (E.g. Matthew 16:21-23.) The temptation in the wilderness is not a final battle of good versus evil, where Christ defeats Satan, but rather a trial run for Jesus in preparation for three years of constant and perfect resistance to powerful temptation, ending with the temptation to save his own life. And there is a degree of temptation he will have to face that we cannot equal. Pride, the primary sin, the great sin of Lucifer, comes to us through our gifts. The temptation to vanity is greatest in someone with a beautiful face; power, it is said, corrupts; great wealth, charm, intelligence — any great gift of this world multiplies the power of temptation. Thus Christ, being possessed of powers beyond any other human, the power of God himself, will face temptation to human pride of an order barely imaginable to us. And yet, in the end, he will be the most humble human who has lived, a servant of the lowliest of us, that we might learn humility. Now, another rhetorical question. How many people, brought to the breaking point by an exhausting ordeal of starvation in a lonely desert, would not use their power to make a loaf of bread? Why, in fact, does Christ not eat? It is not as if he were stealing someone else's bread; there is no sin in eating. And finally, Jesus is often compared to Adam; theologians call him the “second Adam”, with implications beyond our space to discuss here. But we must remember that it was food with which Satan tempted Adam to his fall; and Jesus, by refusing to eat, recreates the temptation — in the barren desert of death, rather than the lush Garden of Eden — and reverses the outcome.